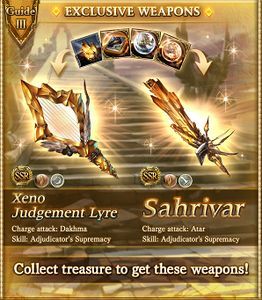 Xeno Vohu Manah Clash is a clash event that rewards items used to trade for the Xeno Judgement Lyre and Sahrivar weapons. 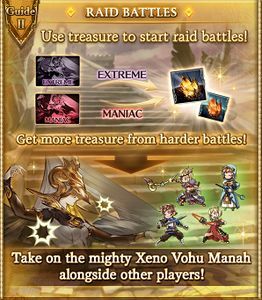 It is an expansion of Vohu Manah Showdown and the associated battles are also available during the event. This event is fairly difficult for new players, with Xeno content being harder than the basic Showdown and extremely punishing to players without Wind teams. Xeno Judgement Lyre is the second weapon to have a massive EX ATK boost weapon skill. It is considered one of the best Earth weapons available. 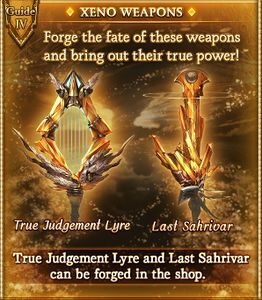 Its forged form, True Judgement Lyre, is arguably the best Earth Superstar/Elysian main weapon. In addition to Godsworn Alexiel's weapons, the harp is a key weapon in Earth Stamina builds. Obtaining enough copies to 4★ a Lyre is a priority for any HL-level players building Earth grids. Depending on your grid and party build, a second True Lyre may also result in a damage gain for your grid due to its EX multiplier. However, its harp typing and somewhat lower core stats may mean this is not the case. See the Damage Formula page for more resources in determining if a second Lyre will be beneficial to your build. For newer players, even one copy of any Xeno weapon is an excellent addition to most grids and can feasibly be obtained by leeching the Event Raid or defeating NM70 a few times (if possible). Tribunal Thunder is a very old weapon with a big Earth ATK boost weapon skill, and remains good for Titan grids. It is acceptable as early filler for Omega grids as well. call effect, which can be useful on some fights. See the Damage Formula page for more information on when to use a Vohu Manah main summon vs. a Yggdrasil Omega summon. Play Xeno Vohu Manah Clash and Vohu Manah Showdown at the same time! Clash battles are harder than showdowns. When you are able to clear extreme- or maniac-difficulty showdowns you should be able to take on Xeno Vohu Manah (Note that Xeno Vohu Manah's resistance to elements other than Wind is notably high, meaning this statement is more of a guideline than hard truth). 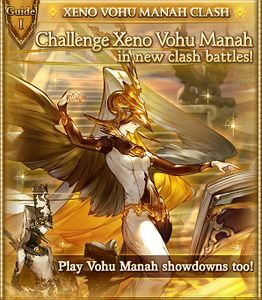 Xeno Vohu Manah maniac-difficulty will unlock after clearing extreme-difficulty. Nightmare battles will appear at random after beating extreme or maniac battles. Xeno Vohu Manah now has 50% damage resistance to all elements except for Wind. Exclusive treasure from this event is needed to forge the xeno weapons. The special attack Apastak has been adjusted. Certain items' drop rates have been adjusted. If unlucky, focus on maximizing the number of Sacrosanct Sutra and True Xeno Vohu Manah Anima received. Do both of the daily maniacs (Xeno and Old Vohu Manah). Do the highest Nightmare possible to maximize Sacrosanct Sutra drops. 0 AP ~1200 EP ~400 raids needed for the Sacrosanct Sutra. Luminous Judgment 190 340 Enough will drop while just triggering NM. Evil Judge Crystal 40 40 Save 40 for forging, use the rest liberally to host raids. Sacrosanct Sutra 45 80 Requires 12-25 NM120 or 35-60 NM70. Vohu Manah Anima 100 100 Enough will drop while just triggering NM. Vohu Manah Omega Anima 90 160 Farm extra EX/NM70 as necessary. Do the Maniacs. True Xeno Vohu Manah Anima 23 43 Leeching raid nets ~0.4 True Xeno Anima. 60% in red chests. Raid red chest can drop a Xeno weapon. It's ~1.5% in the Host chest and ~0.5% in the MVP chest. While Extreme can drop a Xeno weapon, it is very rare. However, the wiki staff does not have enough data on the Extreme drop rate to give a percentage. Estimated cost per weapon is 2000 AP from raid and 2500-3000 AP from Extreme+NM70. Note that Drop Rate Boosts are very important for Extreme+NM70. Small Earth damage to a random ally, 15 times. Small Earth damage to random allies, 30Verification needed. times. Small Earth damage to random allies, 15 times. ≈13000 Earth damage to one ally. Only Xeno Vohu Manah must be defeated to complete the battle. Knocked out after 3 turns. Removes all debuffs on all enemies. to all allies. Heals Xeno Vohu Manah for 350,000 HP. Heals Temple of Judgement for 147,777 HP.
. Heals Xeno Vohu Manah for 350,000 HP. Heals Temple of Judgement for 147,777 HP. 2500 Earth damage to one ally. Inflicts 100% Charge Cut and removes all buffs. Casts Acorn Assault IIVerification needed. . Duration: 10 turns on all allies. to all allies. Heals Xeno Vohu Manah. Heals Temple of Judgement.
. Heals Xeno Vohu Manah. Heals Temple of Judgement. May drop a Green or Blue Potion upon defeat. Earth damage to one ally. Inflicts 100% Charge Cut and removes all buffs. Cost to Host: 0 AP Unlock: May appear after clearing Xeno Vohu Manah Extreme. Guaranteed to appear after clearing Xeno Vohu Manah Maniac. Cost to Host: 0 AP Unlock: Clear Xeno Vohu Manah Nightmare Level 70. May appear after clearing Xeno Vohu Manah Extreme. Guaranteed to appear after clearing Xeno Vohu Manah Maniac. Duration: 2 turns. Heals Xeno Vohu Manah. Heals Temple of Judgement. Cost to Host: 0 AP Unlock: Clear Xeno Vohu Manah Nightmare Level 100. May appear after clearing Xeno Vohu Manah Extreme. Guaranteed to appear after clearing Xeno Vohu Manah Maniac. on all allies. Heals Xeno Vohu Manah. Heals Temple of Judgement. Many of the names and terms in this event are derived from Zoroastrianism, a religion of the Middle East. Vohu Manah is the concept of good moral state of mind, and also occasionally refers to a specific divine aspect of God. The Avesta is the collection of Zoroastrian religious texts. Avestan is the language in which these are written, and the Vendidad is a specific part thereof, a set of religious laws and codes. Avesta is the modern word for the collection, and Apastak is the Ancient Persian word. Ahura Mazda refers to the Zoroastrian god itself, and translates roughly to "mighty wisdom." Dakhma is the Avestan word for the "Tower of Silence", a structure where bodies are placed exposed to open air to be eaten by carrion birds. Blackwind Burial also most likely refers to this practice. Balkh is the name of a city in Afghanistan, generally regarded as the birthplace of Zoroastrianism, where the founder of the religion first started preaching as well as where he died. Navjote is a ritual where individuals are inducted into Zoroastrianism, similar to a baptism. Atar is the concept of holy fire, used for purification. This page was last modified on 21 September 2018, at 10:08.